Today I’m going to show you how to make the best raw ice cream on the planet. This ain’t no typical banana ice cream… It’s the real deal! One of my best friends used to make raw ice cream and he would sell pints of it at the Ojai Farmer’s Market. He divulged this incredible recipe to me and I am going to share it with you right now! We are going to also make a low glycemic version, which has never been done before! 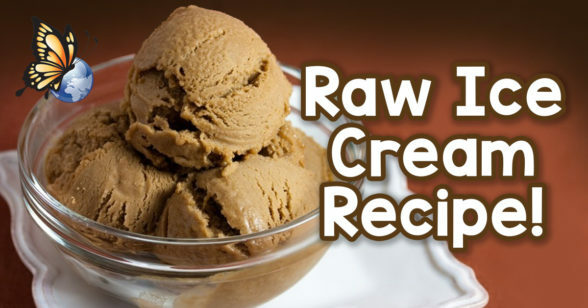 For amazing raw ice cream, blend the following ingredients together in a high-speed blender. Strain mixture through a nut milk bag. Set aside and use pulp for another recipe if you wish. Blend all the ingredients in a high speed blender until you reach your desired consistency. Place in an ice cream maker or a glass container and put in freezer. for delicious raw ice cream! Optional: If in a glass container, stir 2-3 times every 30 minutes for the best consistency. Blend all ingredients in a high-speed blender until you reach desired consistency. Place in an ice cream maker or a glass container and place in freezer. Optional: If in a glass container, stir 2-3 times every 30 minutes for the best consistency. Wow what a recipe! What is coconut butter though? The same as coconut cream?